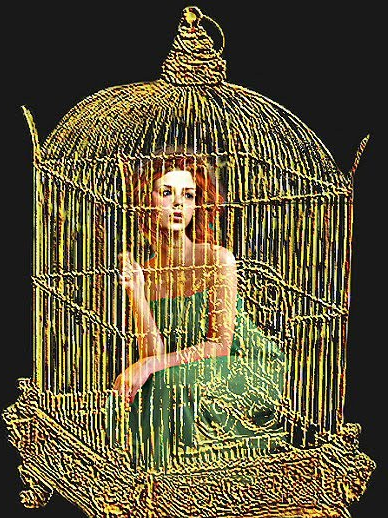 She soon realized, that although this little pet lived in relative luxury, nevertheless it was in fact living in a cage, without freedom, without choice. Of course the little animal didn’t realize this. It spent its days playing in tunnels and on ramps, choosing from a different hay tray and food bowl on each of the cage levels. It was lifted out of the cage every night for playtime and cuddles, but never tried to escape the cage. It stood patiently when the door was opened, never trying to run away, never trying to climb out. Why would it? It had the freedom to enjoy everything it could ever want, hadn’t it? It had no awareness its freedom was restricted in any way. It had no awareness there could be any other way of life, it fully accepted this was the way it was. Of course the little furry pet was unlikely to spend hours contemplating the meaning of its, or anybody else’s life, or consider whether there was any other type of life outside that which it was currently experiencing. The restrictions imposed upon it were never questioned or explored because that was the way the little animal perceived things, so that is the way it was. It would never consider that actually some of those boundaries could have been broached, had it tried. There were some physical restrictions to its captivity but a large part was dependent on its acceptance of the status quo, in its mind. Its owner came to thinking about comparisons to human life. How much do we limit ourselves merely by the restrictions in our own mind? Where do these thoughts come from? Who is restricting us exactly? These thoughts, ultimately, are coming from our own mind. They are not from outside ourselves, there is not a large physical object imposing itself upon us externally, even though it may feel like that at times. We cannot touch our thoughts, smell them or taste them, because they are not physical objects, they are within our own mind. We may feel backed into a corner as if our thoughts were an external enemy, squeezing every inch of breathing space away from us making us feel hemmed in and powerless, but if we take the time to explore we will find this is not the case. Even if we have spent a lifetime trying to recover from traumatic early life events, and the impact these events may have had on our self-confidence or self-esteem, those thoughts are nevertheless now within our own minds, not external, which is good news for us because we can change them. We can choose whether we give them any energy or learn how to discard them. The same happens in all our relationships. Our opinions and conclusions about others are often passing thoughts in our own minds, depending upon how we perceive that person or their behavior in a brief few moments, yet we hold onto that momentary perception as if it were a concrete fact and close our minds to any other possibilities therefore alienating ourselves from others and from reality. We cling to all our thoughts about the world, ourselves and others, as if they were concrete unchanging facts yet without our subscribing to them, they are only temporary like the clouds in the sky. Our mind may feel crammed full of mental busyness but in fact the underlying nature of our mind is vast, peaceful and boundless, just like the sky. To experience this we just need to give the cloud-like thoughts time to pass and dissolve away then we will get a sense of how much space we can create in our mind, how temporary and insignificant most of our thoughts are, and how we mistakenly believe the limitations they place upon us and our relationships with others. Begin to watch the thoughts passing through your mind, without judging them, engaging with them or interacting with them in any way. Just as you would relax in the garden and watch the clouds passing through the sky. Continue to do this for a good few minutes. If you find you have started to interact with any thought, don’t worry, just let it go and continue to watch the steady stream of thoughts, letting them pass through your mind without comment. Gradually this steady stream will begin to slow and you will become aware of where these thoughts are appearing from. You will begin to see how they arise from your own mind, and if ignored how they dissolve back into your own mind, like clouds in the sky. They are not externally formed phenomena with any physical substance whatsoever, you can’t hold them, touch them, smell them or taste them. They have no power or energy unless you empower them by interacting and giving them credence. Gradually you will notice a small space between one thought dissolving away and the next thought arising. Like a small gap between the clouds in a clear blue sky. Continue to experience this. The thoughts will start to subside, your mind will become less busy. You can now switch your focus to the gap between your thoughts, allow it to settle and experience the underlying peaceful nature of your own sky-like mind. Enjoy this spacious state of mind until you feel ready to leave the meditation. This meditation performs many functions. In this case it shows you the real nature of your mind, which is calm and peaceful, and the transient nature of the thoughts which imprison you so often. It shows how our thoughts arise temporarily unless we decide to hang onto them and make them our ‘reality’. Our own mental cage which we in fact, are the key-holder to. How we perceive our thoughts and whether we grasp onto them as reality, or discard those which are not beneficial to our wellbeing, is important for us all. It is particularly important for those with spiritual aspirations, i.e. those having greater concern for developing our inner positive qualities and happiness rather than focusing all our energy towards external material concerns. How can we possibly develop further if we become tied into negative or discouraging thoughts, believing them to be true, fixed and unchangeable? We need to see the transient nature of our thoughts and the world around us to become unfettered from the chains we are imposing upon ourselves. How many of us are like the little pet, believing our own hype due to the restrictions in our mind? Can we really become free from all dissatisfaction and suffering and experience only happiness; Nirvana or Enlightenment in Buddhist terminology? Not if we give credence to negative thoughts (delusions) which bind us down and keep us trapped in our current limited existence, known as Samsara. We are like the little pet who didn’t venture further towards freedom because it couldn’t, could it? 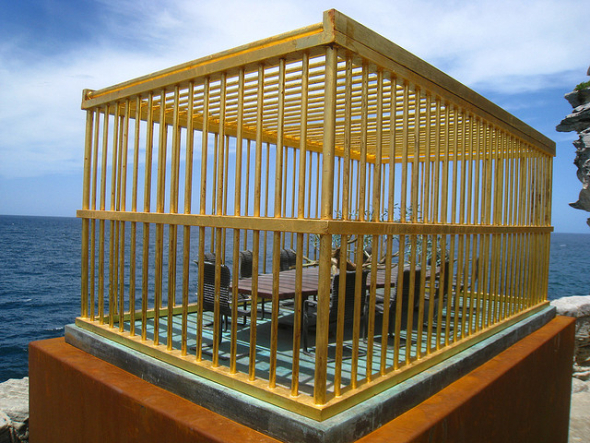 It was happy filling its days enjoying the treats which appeared in the cage, ignoring the possibility of freedom. Like the pet we are not seeing our true situation. Our belief that everything is as we perceive it (self-grasping) actually prevents us from being truly free, from actually experiencing reality, as in the lyrics above. We distract ourselves with our own version of tunnels, ramps and fresh hay believing this is as good as it gets, and that any limitations to happiness are imposed upon us by our external situations. As Buddha once advised, we start with our own mind as true, permanent happiness cannot be found elsewhere. The meditation above , with gentle practise, gives us some experience of the true underlying nature of our own mind, allowing us to gain some understanding of how we limit our potential by our passing thoughts merely because we believe them to be real. If done regularly, we will also begin to experience a more peaceful, happier mind throughout our daily life, enabling us to deal with difficult situations calmly and objectively. You can read much more about reducing negative states of mind and increasing positive happy states of mind in this FREE downloadable book.